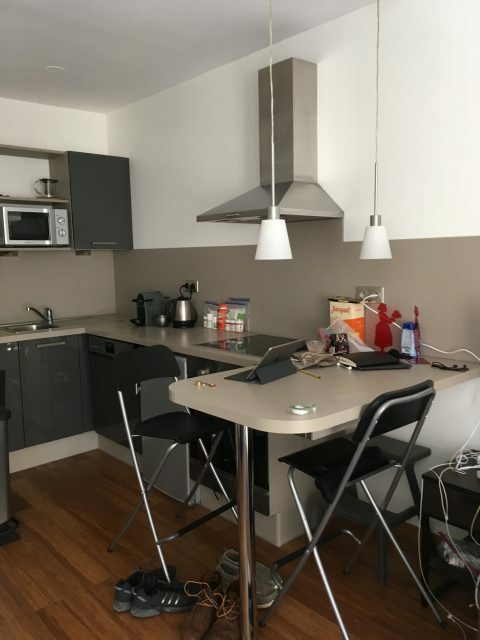 Our apartment is located in the historic central area of Strasbourg. After all of the weekend’s rain and wind, we woke up yesterday morning in Normandy to blue skies and fluffy clouds. It was still cold though – coats were a must. We were out the door though and over to Caen on time to turn in our car, and then were on our way to Strasbourg via LeMans. We were truly sad to say good-bye to Normandy and wished we had given ourselves more time there. The train ride was extremely comfortable – we were in first class on one of the high-speed trains, and I fell asleep for most of the ride. 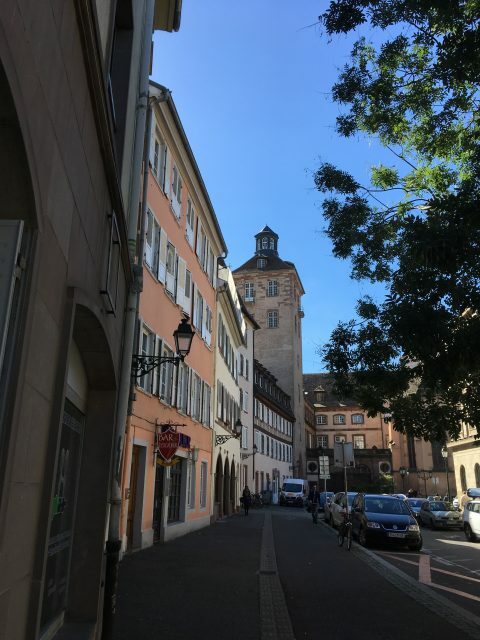 After our usual small spell of confusion upon arriving in Strasbourg, we eventually found and bought tram tickets and got going in the right direction to our location. Our host’s son met us and got us settled in the apartment as our host is currently traveling in Croatia. It’s the smallest place we’ve stayed in yet – less than 300 square feet – but efficient, extremely well-equipped, and comfortable. 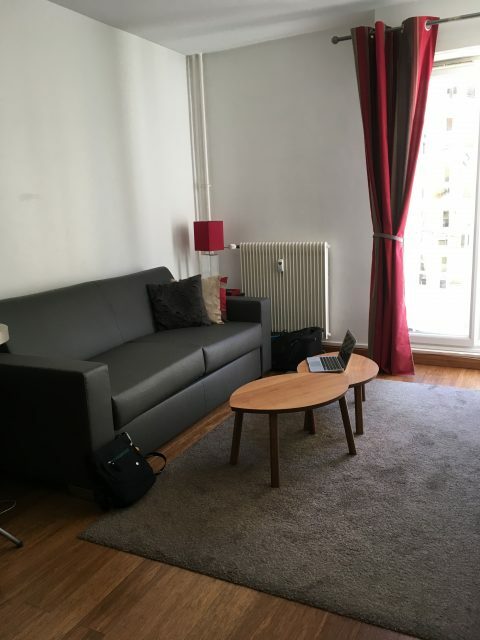 I was a bit concerned because I had not noticed when I reserved the apartment that it was a studio and that we would be sleeping on a sofa bed, but the bed turned out to be the most comfortable yet (and they’ve all been comfortable so far). Before we went to bed we headed down to the mini-mart on the corner and bought some soup and camembert cheese for dinner, and orange juice for this morning’s breakfast. We had carried along crackers and a couple of pain au chocolate from Normandy, and the host had provided coffee, so we were set for dinner and breakfast this morning. The sofa contains an immensely comfortable mattress. Even though the room is tiny, we found room to tuck away our big suitcases, shoes, etc. so it doesn’t feel cluttered. Both Brett and I slept soundly, until almost 11:00 this morning though, meaning both of us were w-a-y more tired than we imagined (especially Brett, who is normally an early riser). We have been pushing ourselves the last couple of weeks, with the short stays in Montevideo, Paris and Normandy, the long flight over to Paris, sightseeing almost every day and moving from place to place. We’ve especially been looking forward to our stay in Strasbourg because we’re here for nearly three weeks, enough time to unpack our suitcases and hang up our clothes for a while (the apartment has a large closet with plenty of hangers and shelves for us to put our clothes away). We’ll be able to catch our breath here. Although we’ll of course be out and about, for a these next few weeks there’ll be little to no pressure to go somewhere or see something every day. If we want to take a day off and stay “home” we can do it and not feel guilty. One of the first things we do after checking into our apartment is put together the gift bag for our host. Our suitcases have been slowly growing lighter as we move along. We’ve ditched a couple of heavy guidebooks along the way (Buenos Aires and Paris), Brett left behind a pair of jeans and t-shirt in Montevideo that he hated wearing, and we’ve slowly but surely been divesting ourselves of the gifts we brought along from Hawai’i. We haven’t bought anything other than the two travel umbrellas on Mont Saint-Michel, but those get carried in our backpacks. We’ve lost only one thing along the way, the package of beeswax wraps in various sizes. Where those got left, or if they even got packed back on Kaua’i is anyone’s guess, but they’re nowhere to be found. We’ve been nursing a couple of Ziploc bags along the way and holding on to any plastic bags we get at a market, and so far that’s been working for us. We went out first thing today to find the nearest ATM and buy provisions for the next few days. There are two nice markets nearby: an expensive Whole Foods sort of place, and a regular supermarket with a boulangerie right between the two. We bought a little at each place including some prepared foods from the Whole Foods place that I can heat in the oven: ratatouille, vegetable lasagna and a quiche. I haven’t felt like cooking since we set out on this adventure, so this will make dinner easy for the next few days. There’s a big farmers’ market every Saturday next to the Whole Foods store, so we’ll check that out too. History is right outside our building’s front door. We’re looking forward to exploring more of our neighborhood tomorrow and in the coming days – we’re just a couple of minutes’ walk from the cathedral and the main historic center. We have laundry to do though before we can really feel settled in. And, I want to spend this evening finding out more about the charcuterie in the area – both stores we visited had many delicious-looking sausages and other meats, but we have no idea where to start. I think we’re going to enjoy being unpacked here in Strasbourg! Sweet efficient apartment seems right up your alley. Those go for around $1,200 a month around here! Looking forward to a tour of you tour:) of Strasbourg. We’ve only been here a day but I’m surprised at how well we’ve fit in here. Suitcases are empty and tucked away, shoes are lined up under the TV cabinet, etc. Going to the laundromat for the first time was an experience though, but so many people stepped up to help so we got everything washed and now put away. Prices in Portland are nuts – prices seemed as high or higher than they were in Hawai’i. I could not imagine paying $1200/month for something this size. One person we spoke with at the laundromat said something this size with the remodels would be around $600 – $750/month here, even in the downtown location. Anyway, if nothing else Brett and I are going to have a very good idea of how much space we want and need once we’re done with this adventure! I like your idea of leaving a gift bag for your host! While I do bring a gift when I stay with friends I had not thought to do at Airbnb or other places while traveling. I am glad you will have a chance to settle in for several weeks here. I am enjoying being an armchair traveler with you two. Thank you! I don’t now where I read about it, but someone said that a small gift left for your Airbnb host was always a nice and appreciated surprise. When we’ve stayed in Airbnbs in Japan we bought wine and chocolates from the Exchange there, but we thought it would be nice this time to bring some small things from Kaua’i. Initially they took up a bit of room in the suitcase but the space they take is diminishing as we go along. For the second part of the trip we’ll pick up some things in Oregon (we’re thinking smoked salmon, hazelnuts and maybe a Portland or an Oregon tea towel. Whatever we get, it has to be lightweight (no more jars of jam, no matter how small). We bought the gift bags over time before we left the island, but neither they nor the tissue cost very much. I have appreciated your previous comments about things to see and eat – they have helped us with some of the planning, or things to look for (like the tarte flambee here in the Alsace). I’m glad you’ve finally found a place to land for a few weeks – although I’m sure it will go by quickly! I’m loving following along on your adventures! 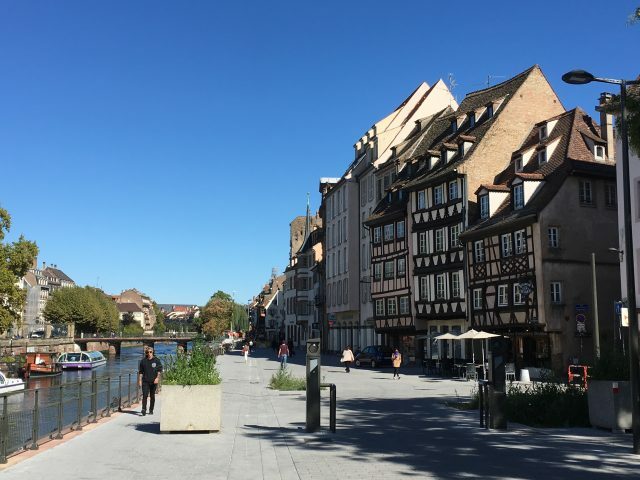 We are so happy to be settled somewhere for a while, and I think Strasbourg is going to be a great place to relax for a while. A couple of people at the laundromat were surprised that we chose to stay here so long (“Three weeks in Strasbourg? Why?”) but we explained that it’s a unique region, plus we’re close to Germany and Switzerland so there’s more to see than just what’s in the city. We found out today we can catch the tram just up at the corner and ride it into Germany, for around $2.00! This is the first place too where people have spoken English to us – they seem excited to get to try it. I just came back from my prolonged vacation and trying to catch up on my blog reading. Sounds like you guys are having an awesome time. I am glad you will have time to relax. Thanks! We are having a very good time, but are happy for the chance to relax a little in the coming weeks. Every where we’ve been we’ve wanted to spend more time there, so we’ve been happy with our itinerary. One young man we spoke with in the laundromat today was from Turkey! He is here to attend the university (studying chemistry) – his English was very good! He gave us some good tips about places to eat, foods to try, and gave us a good overview of student life here, and how much it cost to attend school and live in the city (very little compared to the U.S.). More beautiful pics and food. I love traveling vicariously. We were very grateful for all the help we received at the laundromat, and the conversation was nice too. We had a bit of a scare though – we needed change to operate the dryer so Brett went to to get change. He got lost and it took him 35 minutes to find the laundromat again! It scared him, and I was sure something awful had happened to him and was nearly in tears by the time he got back. There was a mini mart right next door to the laundromat; he could have gone there and bought a bottle of water and gotten change but he never saw the market until after he got back – I have no idea where he wandered off to (nor does he). It was a good lesson though for both of us. I’m glad you like the pictures – I don’t know if I’m posting too many or not enough. Do you have cell phones with you? That is a scary incident, but when I travel I always have a cell phone that will work in other countries. I’ve never been away as long as you are though, but maybe you could buy cheap phones that will work in Europe so if you get separated, at least you could communicate. Just an idea. Oh, and I LOVE all the pictures you’re posting. We do have cell phones, and have free data and texting over here, and a small fee for phone calls (thanks to T-Mobile). We always have them with us when we go out of the apartment. I think getting lost the other day was a big wake-up call for Brett though. He usually has a very good sense of place and direction, and likes to go out and “explore,” but the first day in a new city was maybe not the best day to put those skills to the test. I keep reminding him that GPS is our friend!